In stock -This product will ship today if ordered within the next 10 hours and 20 minutes. Spirulina gives you more energy, a faster recovery time after a period of illness or sports injury and better sport, study and work performance. Due to the high concentration of ingredients within the capsule, one capsule is sufficient for your daily dose. 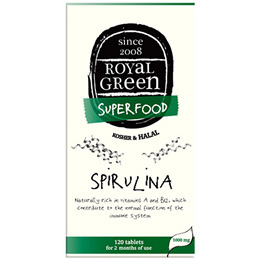 Royal Green Spirulina contains over 60 active ingredients like Vitamin B12, beta-carotene and proteins. Beta-carotene is a precursor of Vitamin A that, like Vitamin B12, contributes to the normal function of the immune system. Vitamin A also contributes to the normal skin and Vitamin B12 to the reduction of tiredness. Royal Green Spirulina is 100% organic, gluten free, 100% vegetarian and vegan and is free from preservatives, synthetic colourants and flavours, pesticides, herbicides and other chemicals. Spirulina is a small algae that belongs to the richest source of whole-food vitamins and minerals in the world. Spirulina contains Beta Carotene, Chlorophyll, Enzymes, Gamma-lynolenic acid and iron. Royal Green Spirulina is Kosher & Halal. Spirulina (Arthrospira platensis), anticaking agent (silicon dioxide). 1 capsule per day, preferably with a meal. Below are reviews of Royal Green Superfood Spirulina - 120 Tablets by bodykind customers. If you have tried this product we'd love to hear what you think so please leave a review.